I hope everyone had a great weekend! I spent most of my weekend cleaning out our closets and donating most of Nikolai's winter clothing as well as his last year's summer clothing which he has outgrown. Looks like I have a lot of shopping to do this week whenever I get a chance. Pocket sandwiches using gyoza/dumpling press are easy and fun to make. 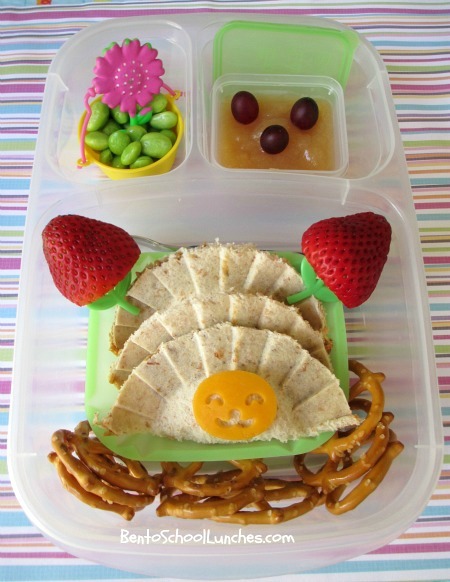 SunButter pocket sandwiches using gyoza press and topped with a cute face colby cheese. Strawberries with picks and pretzels at the bottom. Edamame in a bucket food cup with a flower cupcake pick. Organic apple sauce with tiny grapes in mini-dippers. Packed in an EasyLunchboxes container. So cute! Love the pocket sandwiches! So cute! What a lovely lunch! This is adorable! What kind of bread did you use? These came out so pretty! So what is sun butter? These are adorable! Sunbutter is made of sunflower seeds and it is delicious. It is alternative to natural peanut butter and completely peanut free, gluten free, and tree-nut free.